Put a luscious lemon glaze on these Double-Lemon Cheesecake Bars for a finishing touch. 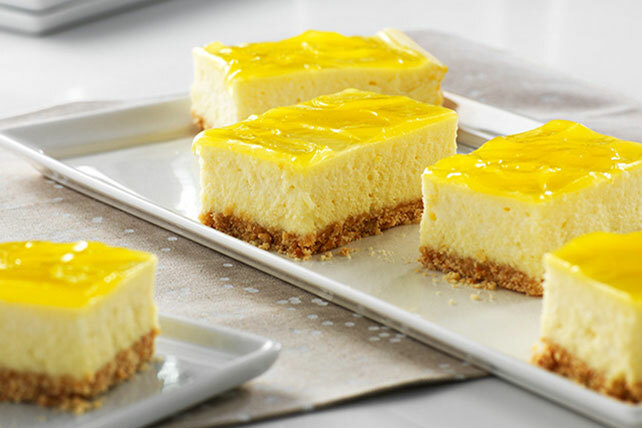 You're sure to love the tangy-sweet taste of our delicious Double-Lemon Cheesecake Bars. Line 13x9-inch pan with parchment, with ends of parchment extending over sides. Combine wafer crumbs and butter; press onto bottom of prepared pan. Bake 10 min. Meanwhile, separate 1 egg; refrigerate yolk until ready to use. Beat cream cheese, 1 cup sugar, flour, lemon zest, 2 Tbsp. lemon juice and vanilla in large bowl with mixer until blended. Add egg white and remaining 3 whole eggs, 1 at a time, mixing on low speed after each just until blended. Pour cream cheese batter over crust. Bake 40 min. or until center is almost set. Cool 1 hour. Refrigerate 4 hours. Combine cornstarch and remaining sugar in medium saucepan; gradually stir in water and remaining lemon juice until blended. Bring just to boil on medium heat, stirring constantly; cook and stir until clear and thickened. Beat reserved egg yolk in small bowl with fork until blended. Add 2 Tbsp. of the hot cornstarch mixture to beaten egg yolk; mix well. Return to remaining cornstarch mixture in saucepan; stir until blended. Cook 1 min. or until thickened, stirring constantly. Cool slightly. Spoon lemon glaze over cheesecake. Refrigerate 1 hour or until firm. Use parchment handles to remove cheesecake from pan before cutting into bars. Serve topped with blueberries. Enjoy your favorite foods while keeping portion size in mind. Garnish with lemon peel strips and fresh mint leaves before serving. This delicious lemon glaze can be prepared ahead of time. Refrigerate up to 8 hours before spooning over individual slices of cheesecake just before serving.